Everyone here in Royal Shakespeare Company (RSC) – from actors to armorers, musicians to technicians – plays a part in creating the world you see on stage. All our productions begin life at our Stratford workshops and theatres and we bring them to the widest possible audience through our touring, residencies, live broadcasts and online activity. So wherever you experience the RSC, you experience work made in Shakespeare’s home town. 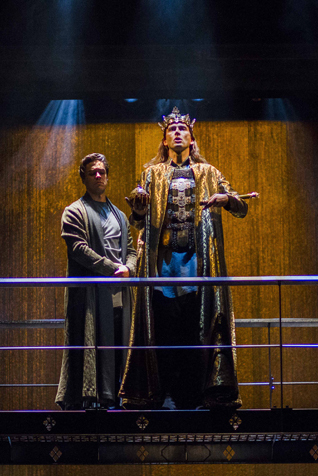 Each year, RSC produces an inspirational artistic program, setting Shakespeare in context, alongside the work of his contemporaries and today’s writers. We encourage everyone to enjoy a lifelong relationship with Shakespeare and live theatre. We have trained generations of the very best theatre makers and we continue to nurture the talent of the future. We reach 530,000 children and young people annually through our education work, transforming their experiences in the classroom, in performance and online. Live from Stratford-upon-Avon marks a new collaboration between the Royal Shakespeare Company and Picturehouse Cinemas since 2013 on the purpose of introducing the best Shakespeare on stage to the audience in UK and all over the world. Live from Stratford-upon-Avon will screen selected productions by Royal Shakespeare Company live from Shakespeare’s home town and has become one of the most phenomenal long-term projects and landmark theatrical event to promote Shakespeare and his works. Live from Stratford-upon-Avon ensure best view of each production for the audience in cinema with a fair ticket price. With cameras carefully positioned throughout the auditorium and high standard of requirement on broadcasting, the audiences may enjoy the every possible detail on stage. or RMB 160 for UCCA members. King Richard II’s uncle, the Duke of Gloucester, has been murdered. His cousin Bolingbroke accuses Thomas Mowbray of causing his death, and challenges him to combat. The King intervenes and banishes both men from the kingdom. John of Gaunt, Bolingbroke’s father, accuses Richard of improper government. When Gaunt dies, Richard seizes all his property, denying Bolingbroke his inheritance. Richard then departs for the wars in Ireland, appointing his uncle York to govern in his absence. Bolingbroke returns to England with an army but insists that he is not leading a rebellion. However, when Richard returns, he discovers that York has allied himself with Bolingbroke and that the country is rising against him. Bolingbroke meets with Richard at Flint Castle. Richard is persuaded to abdicate and Bolingbroke announces his coronation as King Henry IV. York discovers that his son Aumerle is involved in a plot against Henry. Aumerle confesses to the King and is pardoned. In prison in Pomfret Castle, Richard is murdered. Richard’s body is dragged before King Henry. He promises to undertake a pilgrimage to the Holy Land to expiate his sins. Guilt about the removal of Richard troubles King Henry IV’s conscience. He’d like to go to the Holy Land but there are problems at home. Henry faces growing opposition from some of those nobles who helped him to the throne—especially the Percy family. Wales and Scotland are threatening rebellion and Richard’s nominated heir, Edmund Mortimer, looms on the horizon. King Henry’s treatment of Henry ‘Hotspur’ Percy only makes matters worse. Henry’s own son. Prince Hal, is living a dissolute life, frequenting the taverns of Eastcheap in the company of Sir John Falstaff and other disreputable characters. Opposition to the King becomes open rebellion, led by Hotspur – who now supports Edmund Mortimer’s claim to the throne. This rebellion brings Prince Hal back to his father’s side. The King’s army meet the rebels at the battle of Shrewsbury, where Hal vows to seek out and defeat Hotspur. In despair at the death of his son, Hotspur, the Earl of Northumberland I lends his support to a second rebellion, led by the Archbishop of York. As the threat of civil war looms. King Henry IV grows ill. He fears that his son Prince Hal has returned to his old life with Falstaff. The Chief Justice confronts Falstaff over reports of his criminal behavior and, on top of that, Falstaff must face Mistress Quickly in court over unpaid debts. To keep him away from Hal, he is then sent on a recruiting expedition in support of King Henry and renews old acquaintances in Gloucestershire. The rebel army is met by the King’s forces, fed this time by his younger son, Prince John, and bolstered by Falstaff’s recruits. On his deathbed, King Henry is reconciled with Hal, who has begun to distance himself from Eastcheap and his oId friend Falstaff. A new, mature Hal accepts the crown as Henry V.
Soon after his accession, King Henry V considers making a claim to rule France as well as England. While debating the justness of his claim, he receives an insulting ‘gift’ of tennis balls from the French Dauphin and is spurred on to invade France. The King’s former companions from Eastcheap hear of the death of Sir John Falstaff. They set out to join Henry’s army. Henry’s soldiers take the town of Harfleur. While King Charles of France rouses his supporters, his daughter Katherine begins to learn English. The English soldiers—disheartened by sickness and foul weather—make their way towards Calais. On the eve of the battle, Henry tours the camp in disguise and considers the responsibilities of kingship. In the French camp, confidence is high. As battle begins, Henry rallies his troops and places them all in God’s hands. An English victory is confirmed, with miraculously small losses. The battle is named for the castle that stands nearby—Agincourt. Henry woos and wins Princess Katherine to ensure the linking of the two countries through marriage. Beijing ATW Culture Media Co. Ltd.